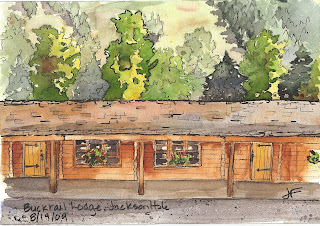 We stayed at a log cabin motel in Jackson Hole for 3 days. Anywhere else the design would be kitschy, but the style fits in perfectly there in the mountains. I sat at a picnic table on the lawn and produced this watercolor/pen & ink rendition of the place. There's a ski run where groups of trees separate large areas of grass on the hill behind the place. I omitted the group of fellow residents who sat on chairs drinking beer all afternoon outside the room at the right! Welcome back, Janice. I love your vacation sketches and they take me back to my visits to those areas in 1965, 1966, and 1996. Can't wait to see what you do from your vacation photos. Wowww Janice. It is my first visit to your blog and I am glad. Nice work. love the wooden effect you have created.